The cat allergen known as Fel d 1 is a major cat allergen and is commonly found in cat saliva. Other cat allergens which includes albumin are found in blood, urine and fur. Cat allergies are very common and allergies to cats occur in nearly 25 percent of people. One reason may be that cats are not bathed and cat allergies are more frequent than dog dander. Cats rub their saliva all over their fur, since cats groom themselves. This results in their dander spreading and allergens spreading. Even if a cat is often bathed, their natural instincts are to groom themselves. 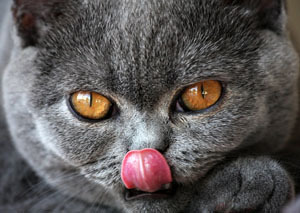 Large amounts of cat allergen are produced mostly by non-neutered cats. In this instance the allergen tends to be somewhat under the control of hormones. Dander is airborne and can be found in places where there are no traces of cats. The dander is carried about on people who already have cats and shed about everywhere. Dander is mostly carried on clothes. Cat allergen is similar to house dust even though a cat may have never lived there. Cat allergen causes asthma symptoms since the dander which is very small is breathed deeply into the lungs. Cat allergy therefore causes the asthma symptoms to develop more rapidly. Some cat allergy symptoms caused by cat allergy are, stuffy nose, inflamed eyes, sneezing, wheezing, coughing, breathing difficulty, rash and chronic asthma. For people who are prone to cat allergies avoiding cats as a whole is the best thing. In case that is not practical, a person can use allergy shots to subside the symptoms. Cat owners may not be inclined to get rid of their pets. Instead they can follow some guidelines as mentioned below to lessen the state of cat allergies that are caused. What Are Some Solutions To Reduce Cat Allergies? Wiping furniture and hard surfaces with a dampened cloth. If you are going to utilize kitchen throw rugs, make sure they are machine washable so that you can easily keep them clean. Some people become immune to their cat allergies from their own pet. However they may still be prone to cat allergies emitted from other cats though its reaction will vary in its intensity. This is not reliable data to go with since allergies may get better or even worse with time. Not all people who have cat allergies have visible symptoms. People have different reactions to allergies. Generally a few symptoms may appear. In case an allergy is severe, a person may succumb to a chill and fever. In such a situation a doctor must be immediately consulted with. Decongestants and antihistamines are some of the best treatments for allergies to cats. This can be made use of when a person experiences asthma symptoms or if they have an asthma attack. If a person has a blocked nasal passage and is continuously coughing they can make use of decongestants. These are taken as shots and can help in prevention of cat allergies. i have a siamese cat named coffee. but her colour changes when she is for hours in the sun. and when we left her alone at home like from morning to afternoon she became very angry and did not allow us to go outside the house as she sat in front of the door. i had a question that should we clip her nails? i am really fond of cats and could u please send me more facts about cats on my email address. i luv ur website! We just got our Siamese she is 2. My 9 yo daughter loves her but…the allergies are just too much. 1st day my daughters eyes swelled and she sneezed constantly. I bathed the cat while she was at school. I am sadden to say cookie my have to leave us. She is the most loving well mannered cat I have ever had. We are saddened. Is there any possible thing I can do to keep her. My daughter was on 6 allergy shots per week and they did nothing in the past. So that’s out.